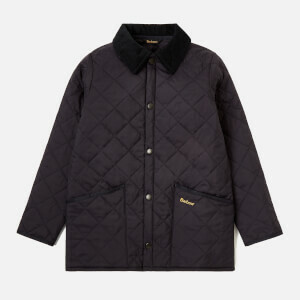 Boy’s black quilted jacket from British heritage brand Barbour’s Country collection. A mini version of the iconic ‘Liddesdale’ jacket, the jacket is crafted from a diamond-quilted fabric and filled with a lightweight wadding for warmth. Fastened at the front with five poppers, the long-sleeved jacket features a classic needlecord spread collar, side slip pockets and buttoned rear vents for breathability. Complete with an internal zip pocket and a signature embroidered Barbour logo to the left pocket.